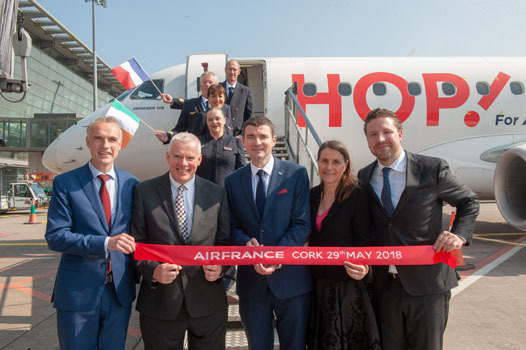 Cork Airport is predicting a record June bank holiday weekend, and the first of its new services – Air France’s Hop! – has landed in a traditional water cannon salute service. Barry ter Voert, Senior Vice President Europe Air France KLM, and Benedicte Duval, General Manager Air France KLM for Britain and Ireland were onboard flight AF1094, alongside French media and VIPs. “Air France KLM has significantly strengthened its presence in the Irish market over the last 18 months and I am delighted to be in Cork today to celebrate the launch of our new operation between Cork and Paris,” he said. The route was initially announced in February as a seasonal service, but due to positive forward bookings the route has been extended to year-round. “Continued investment in both product and route network is a key focus for the Air France KLM group and we are proud to be launching Cork as one of our new daily routes this summer,” Barry added. Brendan Griffin, Minister of State for Transport and Tourism; Niall Gibbons, CEO of Tourism Ireland and Niall MacCarthy, Managing Director of Cork Airport met the delegation, officially welcoming the carrier to the region for the first time. “The fact that it has grown from an initial summer season only service to one that will operate year-round before it even commenced, is a signal of the outstanding confidence placed in this route,” Mr MacCarthy said. Forward bookings indicate that 75pc of passengers booked to fly during the summer months will utilise the opportunity to connect via Paris CDG to Air France’s extensive network of over 180 destinations worldwide. Popular destinations include Rio da Janeiro, Singapore and Johannesburg. The daily flight is operated by Air France Hop! using Embraer 170 aircraft, carrying up to 76 passengers. See more pictures here or connect to the album on Facebook here. TRAVEL Extra’s Sunday Supplement: Is an airline strike a foreseen circumstance? TRAVEL Extra is Ireland's leading source of travel information and travel news. As the publishers of the Business to Business TRAVEL Extra publication and organisers of Holiday World Shows - we reach the largest business-to-business and business-to-consumer holiday audience in Ireland.